Whether you are an archer in an archery range or an enthusiastic crossbow hunter, a crossbow scope is an accessory you cannot do without. In fact, a best scope is as important as the best crossbow itself, so choose your scopes wisely. And to help you do that below is an in-depth analysis of the kind of scope you will need, and a list of 14 best crossbow scope reviews to help you select the one that best suits you. Crossbow hunting seems to be all the rage nowadays with more and more people joining the crossbow hunting bandwagon every day. So how can you become a successful crossbow hunter when you have millions of competitors all over the country? Well, first you will need a scope for your crossbow. A good crossbow scope will improve your shot accuracy and in turn contribute to ethical and quick kills. With everyone advocating for the ethical and humane killing of whitetail deer and other prey, you do not want to be that hunter who causes wild animals to suffer. A scope will also help you spot game before sunrise or after sunset. That being said, it is important to note that crossbow scopes are not the same as rifle scopes. The main difference between the rifle scope and crossbow scope is in their construction. While rifle scopes tend to be longer with bigger objective lenses, crossbow scopes are shorter with smaller objective lenses. But just like rifle scopes, crossbow scopes can be divided into red dot sights and reticle scopes. The latter use crosshairs while the former uses a red dot to aim at targets. Also you can use best archery target for honing your skills. Normally, reticle scopes come with either varied of fixed magnification. 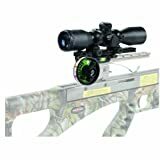 To get a better understanding of the kind of crossbow scope you need, below are the main qualities of a good crossbow scope. 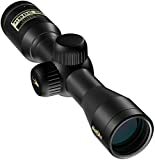 A good or top crossbow scope needs to have a magnification of between 1.5X to 6X. This is because a higher magnification will give a scope a narrow field of view. Therefore, go for a crossbow with a maximum magnification of up to 6X. For a fixed magnification crossbow stick with a magnification of between 3X and 6X. The objective lens is the part of the scope that allows light to enter and thus making it possible for you to see your target. While in most cases a large objective lens is preferred, in a crossbow scope, a large objective lens will be a disadvantage. This is because a large objective lens will add to the overall weight of a scope. And the last thing you need is a bulky scope on top of your already bulky crossbow. Thus, I recommend going for an objective lens of 40 mm maximum. Most crossbow scopes have objective lenses of 32 mm. Having a good magnification and objective lens does not always translate to a good image quality. 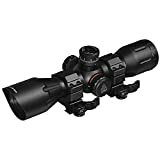 To guarantee that you are able to see targets clearly and brightly, you will need a scope with fully multicoated optics or lenses. This means a scope whose lenses are covered with a layer of reflective coating. This coating will increase light transmission and reduce glare giving you a crisp and clear image quality. Given that most of us hunt early in the morning before the sun comes up and late in the evening after sundown, illumination is another important feature. Thus, I recommend settling on a scope with an illuminated reticle. The illumination will put you on the same level as the animals you are hunting that have a natural advantage when it comes to seeing at night. The last thing you want is being spotted by your prey. It is for this reason that top rated crossbow scopes come with camouflage color. This makes them inconspicuous to wild animals and thus makes it harder for you to be spotted. The best scope for crossbow hunting is one with a nitrogen filled tube. The nitrogen prevents water and fog from filling the inside of the tube. This makes a scope fog proof as well as waterproof. Thus, for a scope to survive the great outdoors, it needs to have a tube filled with nitrogen. The first scope on my list is one that has all the qualities of a good crossbow scope. Dubbed the Sightmark Core SX scope, the latter has a rugged body and measures 13 inches long. Based on my analysis this scope is best suited for targeting medium sized game. As for crossbow speeds, the 1.5-4.5X magnification is best suited for bows with speeds of between 250 and 400 FPS. Of worth noting is that this scope has an illuminated reticle with 11 brightness settings. This is of great benefit as it makes it capable of adapting to different hunting conditions. And while it does not look like much, this Sightmark can hold its own against most crossbow recoil. In all honesty, the Sightmark Core SX has no cons worth mentioning. 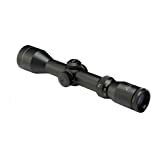 This coupled with its affordable price tag makes it one of the best scopes for hunting medium sized game. Additionally, it is one of the best scopes in its price segment. If you use an Excalibur crossbow, you will need a scope to match the performance of your Excalibur bow. And of the many scopes out there the Excalibur Twilight Dlx scope is the best for an Excalibur bow. With a variable magnification of 3X to 6X, this scope allows you to get precise shots on target. And with a 44 mm objective lens, you get a pretty amazing field of view as well. To make sure it matches the performance of Excalibur crossbows, this scope is designed to be compatible with bows that fire at speeds of between 300 and 400 FPS. The scope is made from an aircraft grade aluminum, which means it can withstand the occasional knocks and bumps. In summary, the Excalibur scope is designed for use with powerful crossbows. That being said, this is the kind of scope I would recommend to any serious hunter, in particular, hunters who are accustomed to taking down large game. I have always loved Nikon crossbow scopes. Thus it should come as no surprise that one of my favorite scopes is the Nikon Bolt XR crossbow scope. I have used this scope several times and have never been disappointed. With a fixed 3X magnification, this scope can zero in on targets from up to 60 yards. This paired with the 32 mm objective lens means that you get a scope that is both clear and bright. The construction of this scope is top notch. Measuring 8.1 inches long, the scope is not overly long. Also, it is designed to be water and fog proof. When you get past the Nikon XR’s lack of an illuminated reticle, it is a really great scope. First of all, it is affordable and comes with some of the features found in pricier models. That being said, it is the kind of scope I would recommend to a new crossbow hunter. Furthermore, it is lightweight, small in size and is affordable. 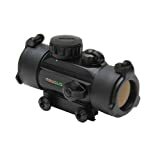 One of my favorite crossbow scopes is the Excalibur Tact-Zone Illuminated Scope. Since I bought this scope, it has been my go-to scope for most of my crossbows, and for good reasons. One, the scope is compatible with bows with speeds of between 275 and 400 FPS. Therefore, it fits in well with a wide variety of crossbows. In regards to magnification, this scope boasts of a 2.5X to 6X magnification backed by a 32 mm objective lens. There are very few scopes that offer a better balance of affordability and quality than the Excalibur Tact Zone. To put things into perspective, this is arguably the best cheap crossbow scope from Excalibur. In fact, the scope is so good that it has close to no cons to speak of. In summary, this Tact Zone scope is the best scope for you, if you are looking for an affordable scope. I am always open to testing new crossbow scopes. And since I have many crossbow hunting buddies I have used quite a number of scopes, one of which is the Hawke Sports Optics. The latter scope is a great scope to have. I have to say I was not disappointed by this Hawke crossbow scope. It has everything you would need from a crossbow scope. Also, its size was a big plus for me as I do not like big and bulky scopes. Additionally, the fact that it works with a wide variety of crossbow scopes means it makes a great primary crossbow scope. I am always looking for new scopes to add to my collection of cheap but high-quality scopes. So when I stumbled upon the Trophy Ridge Speed Comp scope, I was not about to pass out on it. I have been using this scope for about one and a half years, and it has proven itself to be reliable. In fact, it is one of the scopes I use most frequently. Reason being that it has all the features I was hoping to get out of it, an illuminated reticle, a compact size, fully coated optics and a wide field of view to match. For a scope that costs less than $ 200, the Trophy Ridge Speed does a pretty good job of keeping up with the competition. It has most of the premium features you find in pricier models. Also, it has close to no cons. Thus it makes a great scope for crossbow hunting. There comes a time when buying a riflescope for your crossbow makes more sense than buying a basic crossbow scope. When such a time comes, I recommend the Sightmark Photon XT. This is a night vision scope design for helping you see in darkness. Being one of the best night vision crossbow scopes available, this Sightmark model is awesome. It has a fixed magnification 4.6X and a large objective lens of 42 mm. Thanks to its amazing features an design, this scope can spot targets from a distance of 120 yards. Additionally, it has two different reticles that work well with bows of speeds of 320, 350, 370 and 400 fps. If you are looking for crossbow night vision scopes, this Sightmark model should be high on your list. While it has some minor design flaws, it is important to remember that this scope is designed for a rifle. Thus, the fact that it works well on a crossbow is a bonus, especially if you use both a rifle and a crossbow. The smallest night vision scope in Yukon’s line of Titanium rifle scopes is the Yukon NVRS. While it does not look anything like an ordinary scope, it does have some pretty impressive features. One of which is the PULSE IR illuminator. This is an infrared illuminator designed to conserve battery power. This IR illuminator is so impressive it has been known to illuminate up to a distance of 100 yards. The IR illuminator is an added bonus to the scope’s red illuminated reticle. To crown it all off, this scope can be fitted with a digital camera. 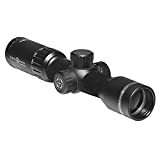 Being one of the smallest and lightest scopes on the market, this scope is designed for short range and long range hunting. However, due to its affordability, it is prescribed for varmint killing and hunting small rodents at night. Bottom line, this is one of the best night vision crossbow scopes designed for the budget conscious buyer in mind. I recently bought the Tenpoint Crossbows illuminating Rangemaster pro scope for my Tenpoint Venom crossbow, and I have to say this scope is pretty amazing. Not only is it shorter measuring 10.8 inches, but it is also durable thanks to its all-aluminum body. I was pleased with the scope’s illuminated reticle with 5 brightness settings. Additionally, I found the eye relief of the scope to be quite comfortable. And even though Tenpoint does not indicate it, I put its eye relief in the 3.5 inches range. As for the objective lens, the 30 mm objective lens was smaller than what I am used to but combined perfectly with the 1.5X to 5X magnification to give a wide field of view. Sure, it is not the best scope under 100, but it could be if its price was a little bit lower. Nevertheless, it is a great scope to purchase, considering its features. Also, considering its weight and size. It weighs less than some of its competitors that cost less. Also, since it’s made entirely of aluminum, it is durable and rugged. In summary, this scope stands out among cheap ten point crossbow scopes. The Hawke Crossbow 1.5-5X32 SR scope is a favorite among crossbow hunters, the reason being that it is a versatile scope capable of withstanding harsh weather, knocks, and bumps. Additionally, it works best with crossbows with speeds ranging from 275 to 425 FPS. And that’s not all, the scope has flip covers over its lenses and has an illuminated reticle. Also, to make it more versatile, the scope has a speed adjustment feature. Thus you can adjust it to match the speed of your crossbow. The fully multi-coated optics on this scope mean that you get clear and crisp images. 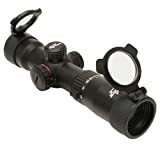 This Hawke scope is a great crossbow scope for hunting fast moving prey. In this regard, it is the kind of scope you want to get when you have a fast shooting crossbow. Thus, while it is rather pricier than some of its competitors, it is price tag is worth it. The TenPoint Crossbow 3x Multi-Line crossbow scope is one of the best crossbows scopes on the market. It is lightweight, affordable and compact measuring 7 inches long. And as its name suggests, it has a fixed magnification of 3X that is paired with a 32 mm objective lens. This means that its field of view is fantastic. And while its reticle is not illuminated, it has fully multicoated optics that compensate somewhat for its lack of illumination. Furthermore, the scope comes with mounting rings to make it easy to mount it on your crossbow. In regards to weight, it is a lightweight scope weighing 13 ounces. The Multi-line crossbow is affordable, lightweight and compact making it a sure bet for any crossbow hunter interested in a cheap crossbow scope. Also, its lack of illumination is to be expected given its low price tag. In conclusion, this TenPoint crossbow is an awesome choice for entry level or beginners crossbow hunters. Costing just under $ 100, the UTG 4X32 Crossbow scope has features that you would expect from a pricier model. Measuring 8 inches long and weighing 12.3 ounces, this UTG model is a great option for most crossbows. When it comes to great bargains, the Leapers UTG is quite a bargain. Though it costs just under 100, it works great with fast crossbows. Moreover, the scope’s lens coatings are exceptional and offer a clear and crisp image quality. In summary, this UTG model offers the perfect balance of affordability and quality. Sometimes a Red-Dot sight is just what you need to make the shot, and there is no better sight than the Truglo Red-Dot 30 mm 3 dot sight. With three target red dots, this Truglo crossbow scope works well with most crossbows. Also, it can be used on a shot gun and on most rifles. As a red dot sight, it does not magnify the target. Rather it gives you the ability to view your target clearly. In this regard, the lenses on this red dot sight are multicoated, and the tube is filled with nitrogen to prevent fogging. Since it is designed to work on a shotgun, this scope is exceptionally durable and tough and is made from aircraft grade aluminum. For its price, this Truglo Red dot sight is a great alternative to iron sights. Additionally, it is designed to work on a wide array of firearms, crossbows included. Thus, it is a multi-purpose sight that you can use with all your hunting firearms. Additionally, thanks to its construction, it does not break down easily. 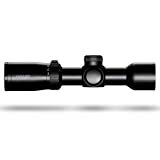 The black colored HHA Optimizer Lite Speed Dial Illum scope has to be one of the best scopes on the market right now. And while it is pricier than most other scopes, its pricey cost is justifiable. To begin with, this scope comes with features not found in other scopes in the same price segment. For example, unlike other scopes, it comes with a lite speed dial. Thus it is customized for fast shooting crossbows. In particular, it works with crossbows with speeds of 350 FPS. For a scope that costs just above 250, this scope is truly worth its price tag. All its features come in handy when hunting using a crossbow. Additionally, it is lightweight and compact thus it does not add any bulkiness to your crossbow. In summary, this is a great scope to have and to use on various crossbows. The search for the best crossbow scope is never easy as you have to do a lot of research before settling on a scope that best suits you. Nevertheless, the above-reviewed scopes offer all the features you require in a crossbow scope. Thus, from this list, you can get crossbow scopes with a rangefinder as well as basic crossbow scopes. It is my hope that this review article has been of help and has connected you to the scope that best matches your crossbow hunting needs.